German prepared defensive lines south of Rome. 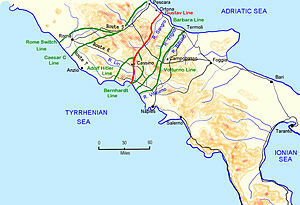 The Hitler Line was a German defensive line in central Italy during the Second World War. The strong points of the line were at Aquino and Piedimonte. In May 1944, the line was renamed the Senger Line, after General von Senger und Etterlin, one of the generals commanding Axis forces in the area. This was done at Hitler's insistence, in order to minimise any propaganda significance should the line be penetrated. The line was a so-called "switch line", joining the Gustav Line at Monte Cairo and providing a fall-back position behind the Gustav Line should it be penetrated. The line was breached on 24 May 1944 on the British Eighth Army's front by the 1st Canadian Infantry Division and 5th Canadian Armoured Division attacking with II Polish Corps on their right. The Polish Corps captured Piedimonte on 25 May and the line collapsed. The next German line was the Caesar C line. This page was last edited on 24 July 2016, at 15:45 (UTC).